The EAF SMARTrafo Project presented at the 11th European Electric Steelmaking Conference & Expo, 25-27 May 2016. Home > News > The EAF SMARTrafo Project presented at the 11th European Electric Steelmaking Conference & Expo, 25-27 May 2016. 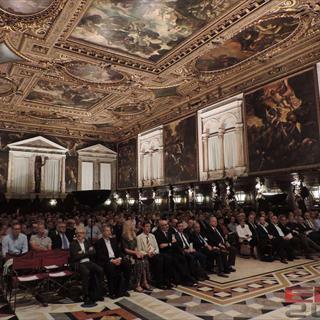 The prestigious 11th European Electric Steelmaking Conference & Expo was held last week in Venice, at the magnificent Fondazione Cini. The event was host by AIM, the Italian Society for Metallurgy. The Conference has provided a forum for information transfer of the latest techniques and applications in electric furnace steelmaking and at bringing together steel producers, research and academics active in steelmaking industries, energy production and plant supply concerns. We've participated and presented the TES' EAF SMARTrafo Project: a revolutionary solution in EAF Transformers. A smart and tailor-made transformer was designed in order to reduce energy losses, improve efficiency and achieve a short-term return on investment. A series of best practices and technological innovations, developed by the R&D department, will provide remarkable savings in EAF meltshops. The efficiency of the system has also been verified by the engineering department of the University of Brescia (Italy). First of all we would like to thank our customers and friends for being there. We invite everyone who couldn't be present at the conference to download the presentation of our project and not hesitate to contact us for any further information about it.